Combine lime juice, agave, pineapple, and serrano slices in martini shaker. Muddle ingredients until pulpy. Add tequila and Cointreau. Add ice. Shake vigorously. Strain and pour over ice. Combine lime juice, agave, kiwi, and mint in glass. Muddle ingredients until they are mixed thoroughly. Add ice. Add rum. Top with soda. Briefly stir and serve. *Non-alcoholic version: substitute 7Up or Sprite for the rum. Combine watermelon and basil in martini shaker. Muddle ingredients until fragrant. Add vodka. Add ice. Shake vigorously. Strain and pour over ice. Top with soda. Briefly stir and serve. *Non-alcoholic version: substitute club soda for the vodka. 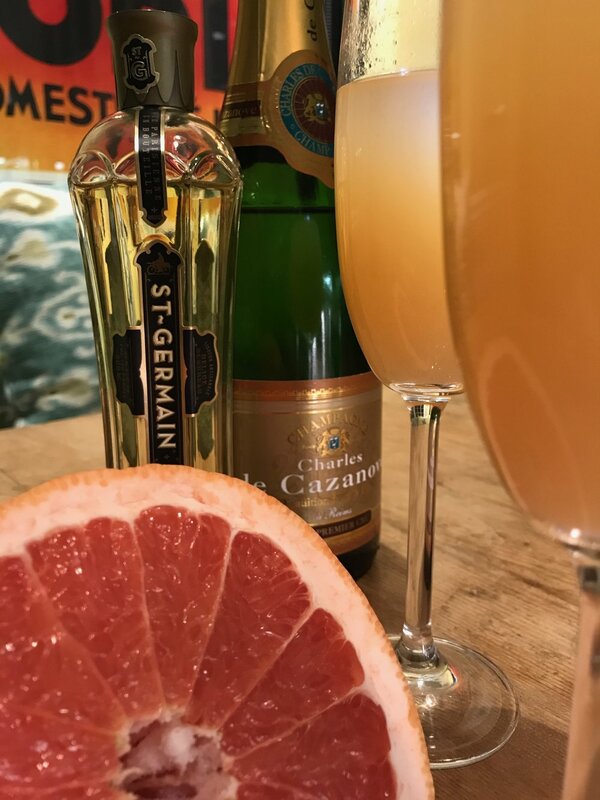 In a champagne flute, combine St.-Germain and grapefruit juice. Top with champagne. *Non-alcoholic version: substitute Jarritos or Hansen's Grapefruit Soda for the champagne and St-Germain. Cook potatoes (skin on) until they’re fork tender, then peel and dice. Poach chicken breast (skin on), then take take skin off and dice. The dice on everything all the above should be small — around 1/4 inch. Cook green peas, then shock with ice water to maintain green color. Make sure all the above is cold or at least room temperature, then toss all of it together with the pickles. Once it’s all mixed, add the lemon juice, the mayonnaise and toss together until everything is coated. This is a matter of taste, so if it feels it could use more mayonnaise, then you can add more, but only a spoonful at a time, so you don’t end up overdoing it. Finally, add salt and pepper to taste. I personally like more of a lemony flavor, so I always toss in some lemon pepper in addition to the salt and pepper, but this is optional. If you do add the lemon pepper, then you might want to add less regular pepper. Cover and refrigerate for at least 2 hours and preferably overnight. The flavor and texture continue to blend and develop the whole time. Can be kept for up to 4 days covered in the refrigerator. 5) as the omelet begins to solidify ("set-up”), use a silicone spatula to gently pull a little of the edge of the omelet back toward the middle of the pan (this prevents the edge from browning) and then tip or “swirl” a bit of the remaining uncooked egg into the “open” area on the pan. Continue this, pulling at the edge of the omelet, working around the pan in a circle to clear and refill a little new section until most of the loose/uncooked egg has been spread around. 6) When there’s no more loose egg but the top surface of the omelet is still glossy, remove it from the heat and let it “rest” for one minute to finish cooking. If you’re going to add any fillings, do it as soon as you take it off the heat.. Chris likes no fillings. Maybe chives. Add any fillings in a stripe about 2 to 3 inches wide down the center of your omelet/pan. Lightly season with pepper and just a touch of salt. 7) French omelets are folded in thirds (see the picture) — with the help of a nonstick-safe spatula, fold one edge of the omelet across the middle (mostly cover any fillings if you’ve added any), then fold the other edge across almost all the way to the edge of the first fold. Get your plate ready. 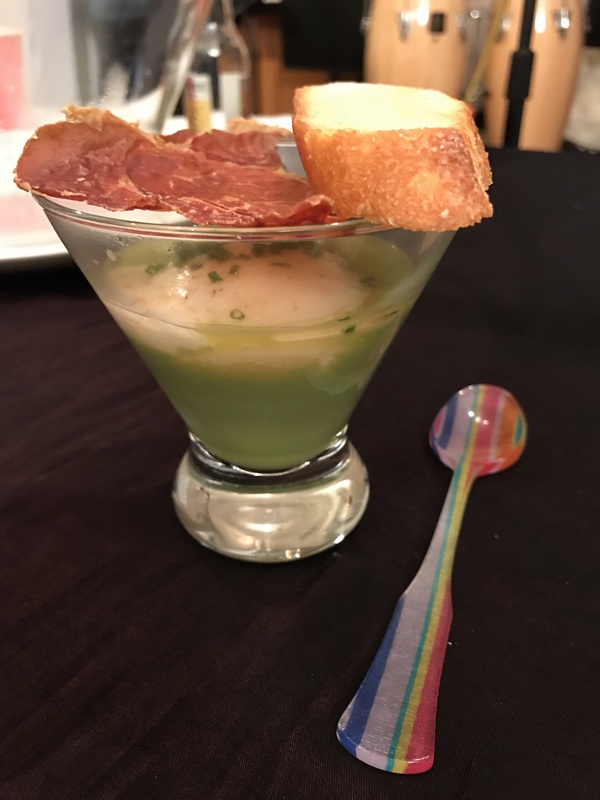 Tip the pan up and “pour” the omelet onto the plate, top with some flake salt and a few chopped chives if you wish, and…. Voila. A buttery/French option: add a little pat of butter to the newly-exposed pan after you’ve made your first fold, this will add a glossy shine to the surface, make the omelet slide out a little easier and taste delicious. If it doesn’t come out “perfect”… it’s still going to taste like it is! This recipe is easy to make, versatile, and very good. It requires just enough “to-do-ing” that you feel like an accomplished baker, but never so much that it becomes a chore to produce. *A note on “very ripe” bananas: These can be seriously ripe — we’re talking well past the point where you would consider eating them out of hand and, really, even beyond smoothie territory. Liberally coat a light-colored metal 9” x 5” loaf pan with non-stick spray. You can use a dark metal pan, but the bread will brown more quickly and develop a more pronounced crust. I don’t like either of those things to happen. And let’s not even talk about the gummy, disappointing results to be had with a glass loaf pan . . . In a shallow, medium bowl, use the back of a fork to smash the two bananas to a gruel-like consistency. Add to this the sugar, oil, and the egg. Stir to combine thoroughly. In a second bowl, combine the flour, baking soda, and salt, before adding to the wet ingredients. Gently mix the batter until just combined, scrape it into the prepared pan, and place it in the center of the preheated oven, where it will bake for at least 40 minutes, and perhaps up to 50 minutes, before it is ready. The inexactitude can be maddening, but this is what comes of playing fast and loose with relative banana sizes and degrees of ripeness. As you make this recipe again and again (and you will want to), you will become more familiar with the vagaries of fruit and pan type. In the meantime, somewhere around minute 38, your loaf should be domed and golden. You can plunge a long wooden skewer into the center of the bread to test for readiness. If it comes out wet, there is more baking ahead. When it comes out clean or with just a few moist crumbs adhering, your loaf is ready. Remove the pan from the oven and let it rest on a cooling rack. If you prefer a moist, more yielding loaf (or think you may have left the banana bread in the oven for a few more minutes than is strictly optimal), carefully turn out the bread as soon as you can manage it, set it upright once more on the cooling rack, and drape it with a light dishcloth to let it cool. Otherwise, you can just let the loaf sit in the pan until it is cool, at which point you can turn it out, perhaps sprinkle it with a light dusting of powdered sugar, and serve. If you like walnuts — and I do not, which is why I am waiting until the end to tell you this — you can chop up half a cup or so and add them to the batter before pouring it into the pan. You might also consider swapping in the same amount of chocolate chips. Certainly, to do so will wreck entirely the illusion of banana bread as "healthy" — or, really, as “bread” at all, since what you have now is closer to chocolate chip banana cake. But is that so wrong? I will tell you that I once chopped up a pretty hefty serving of the chocolate-peanut-butter-chip fudge we sell at Big Sugar Bakeshop and tossed it right into the batter before baking. That was an excellent experiment. The point is, this banana bread is easy to make, relatively forgiving, and open to interpretation. Enjoy. Mix all other ingredients in a tall-bar or tiki glass filled with cubed or crushed ice. 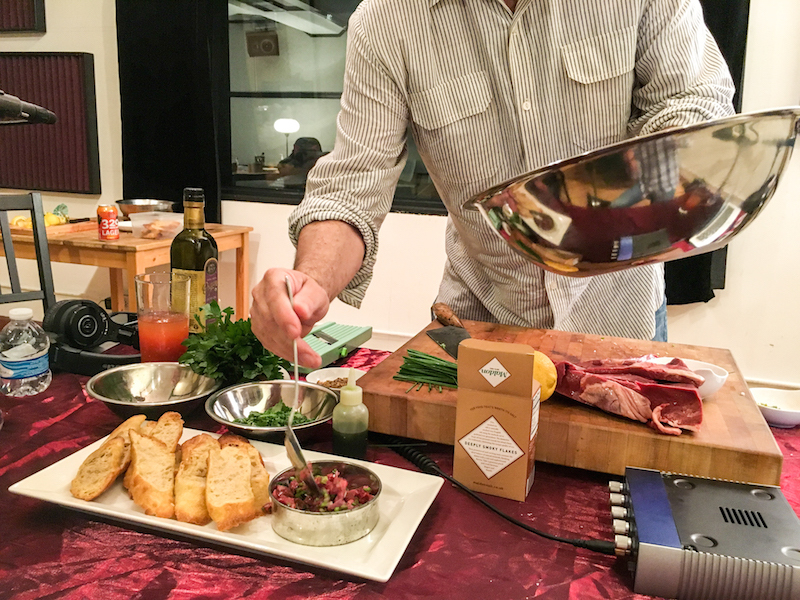 Chill the beef-heart and hanger steak for 20 minutes in the freezer, this makes it easier to chop finely -- don't overdo this! 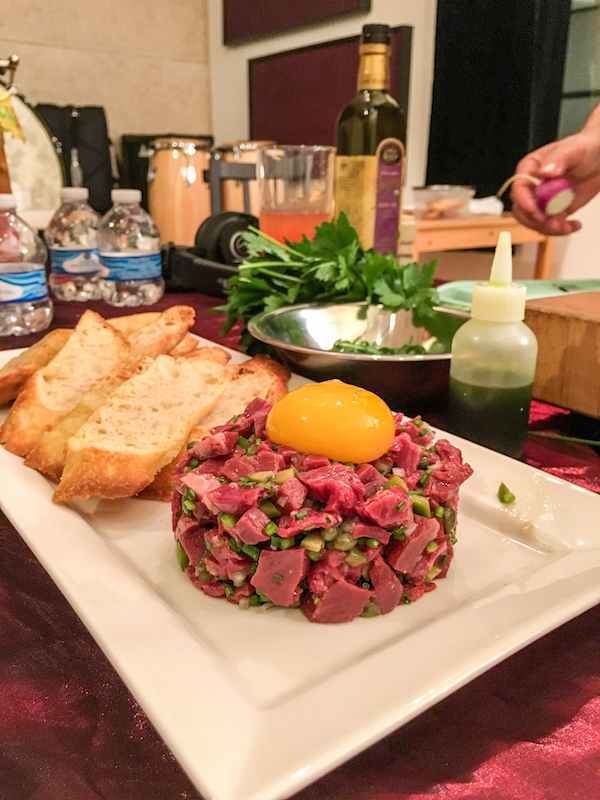 NOTE: A perfect accompaniment for tartare (as they are the perfect food) are crisp, hot fried potatoes -- I prefer a thick-cut or "steak-fry" style, twice-fried, if possible.